Here is a taste of the indoor version of paradise. Inspired by the omnipresent blogger culture, interior designer Catherine Kwong has created the ultimate fashion writer's haven en suite to the master bedroom of a San Francisco mansion. It features luxury custom finishes throughout (check out that cabinetry!) and a selection of classic mid-century pieces, like a sleek Eileen Grey desk lamp, as well as sartorially-inspired art, including a large-scale backstage photograph of a 1954 Balmain show. Of course the entire room is centered around the most important piece of furniture in any blogger's life - the desk. 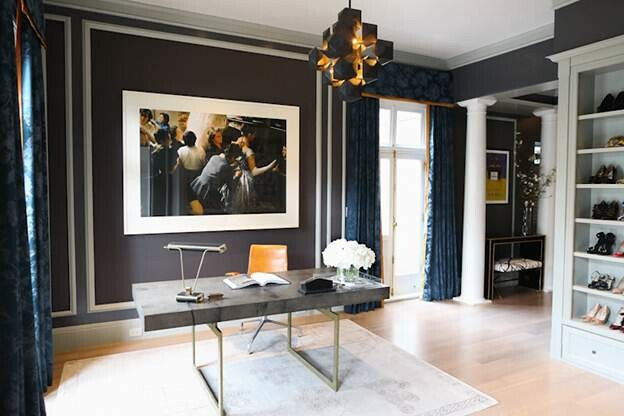 Julian Chichester's "Cortes" desk lends an art-deco feel to the room, while a lavish Mansour Modern rug and a cubist Blackman Cruz chandelier round out the polished yet eclectic feel of the space. The entire 11.500 square foot property will be on display as part of the 35th Annual San Francisco Decorator's Showcase. For more information on the event visit this link, and hopefully you will be inspired to create a blogging sanctuary of your own. Beautiful. I saw this as well and was stunned by how gorgeous it is! Her home is amazing! Getting so inspired!